Deswik.CAD now features in-built survey functions, commonly used by underground surveyors internationally. Advanced underground solids creation tools automatically generate valid solids from tunnel as-builts or stope CMS scans and calculate overbreak and underbreak. 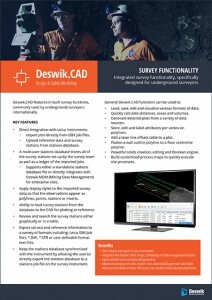 For more information, download the Deswik.CAD Survey functionality flyer. 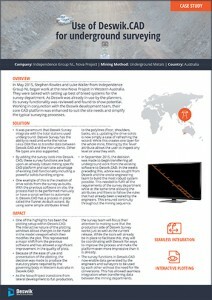 In May 2015, Stephen Rowles and Luke Waller from Independence Group NL began work at the new Nova Project in Western Australia. They were tasked with setting up best of breed systems for the survey department. As Deswik was already in use by the planners, its survey functionality was reviewed and found to show potential. Working in conjunction with the Deswik development team, the core Deswik.CAD platform was enhanced to suit the site needs and simplify the typical surveying processes. The survey functions in Deswik.CAD now enable data generated by the engineers and surveyors to be used by each other without the need for file conversions. This has allowed seamless integration when transferring data between the mining departments.